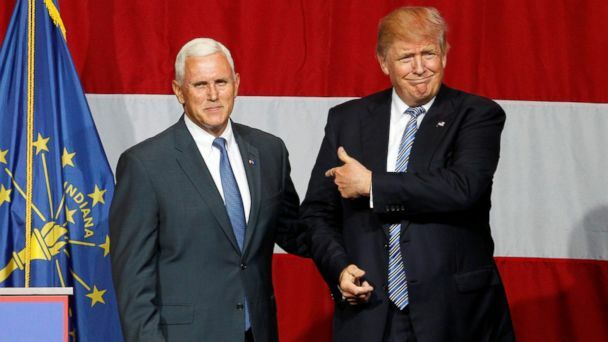 Donald Trump asked Mike Pence to be his running mate, and the Indiana governor accepted, a source with direct knowledge tells ABC News. ABC News confirms that Pence was seen landing at an airport near New York City this afternoon. The official announcement was slated to be made at a news conference at 11:00 a.m. on Friday in New York City, but Trump tweeted this evening that it would be postponed "in light of the horrible attack in Nice, France." It became clear that Trump was warming to the prospect of selecting Pence in recent days, since he spent time with him in Indiana on Tuesday and Wednesday. Pence introduced Trump at a rally in Westfield on Tuesday night, and Trump ended up spending the night in the Hoosier State because his plane had some mechanical issues. Trump asked his family to fly to Indiana on Wednesday morning for a meeting with Pence at the governor's house, sources said. The meeting included Trump's children Eric Trump, Donald Trump Jr., Ivanka Trump and her husband, Jared Kushner. Sources told ABC News that the meeting went very well but that the running-mate job was not offered to Pence at that time. Speaking to reporters after the meeting, Pence remained mum about his VP prospects. He described the meeting as "just very warm and just one family meeting with another." Trump gave a phone interview on Fox News this evening, denying that a decision has been made and praising his top three candidates: Pence, New Jersey Gov. Chris Christie and former Speaker of the House Newt Gingrich. "I haven't made a final, final decision," he said. During the interview, he did not address the postponement of the news conference that was slated to announce his vice presidential pick tomorrow.